Most of us know nothing about this Caucasus country, Armenia. In case you too are clueless about it, Armenia is a country in the South Caucasus region of Eurasia between Europe and Asia. The charming blend of East and West is very apparent here. 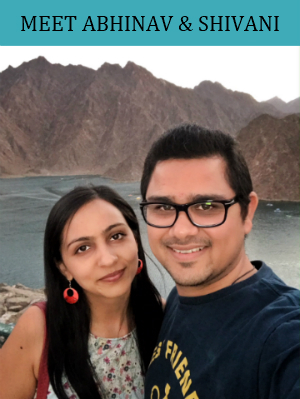 Our trip to Armenia started from 15th June to 19th June 2018. 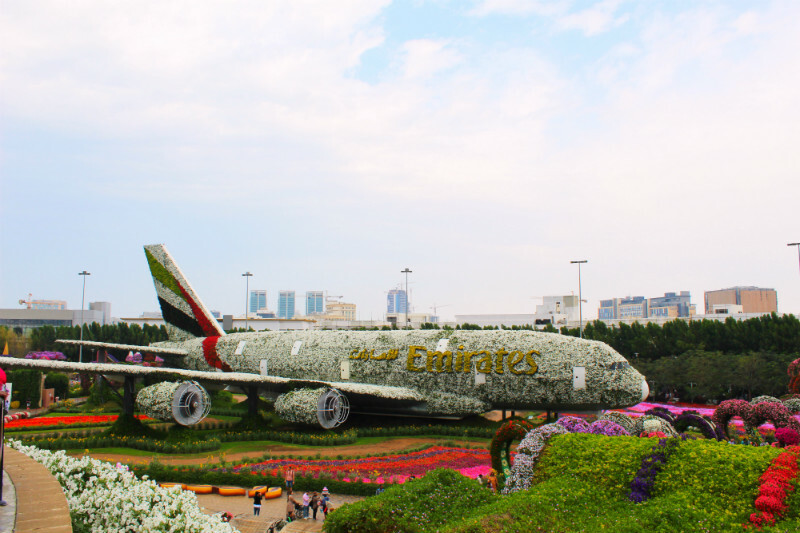 We booked our flight via flydubai and spent five amazing days in this beautiful country. 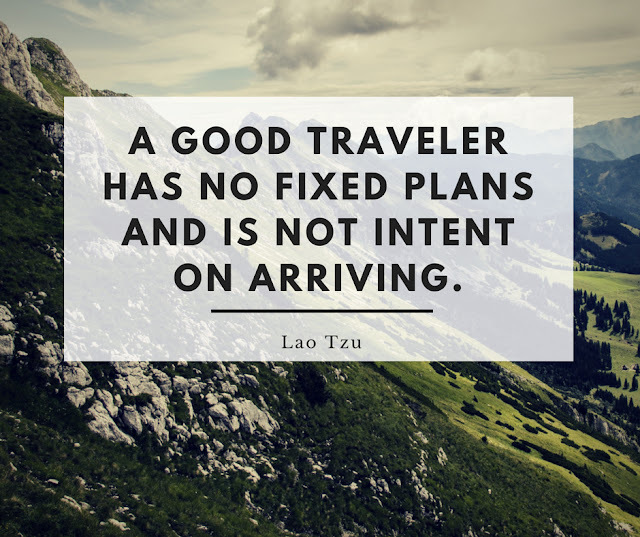 Our itineraries were all planned and we had already booked our staycations as well. We left Dubai on 14th June (night) from Terminal 1 and reached the Zvartnots International Airport in Armenia on 15th June. We had visa on arrival that costs us AMD 3200. We were six (three married couples) and therefore hired two taxies from the airport to reach our hotel in Yerevan. Our hotel was around 13km away from the airport and we paid AMD 6000 for each taxi. We checked in at the Bass Boutique Hotel in Yerevan. Although it's a 4* hotel, there's no need to spend so much amount to stay in Yerevan. The hotel was good but not worth the price. 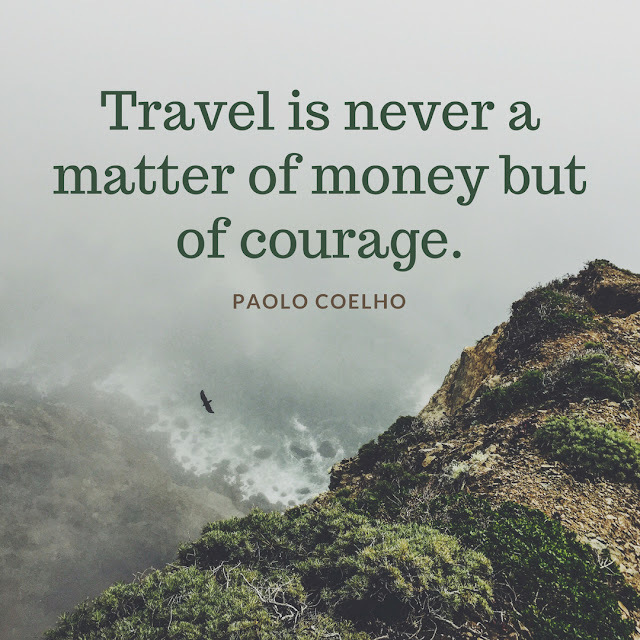 We could have booked a cheap hotel or guest house or apartment instead. After checking in, we slept for a few hours so that we won't feel tired later that day. We woke up around 8 am and had breakfast in the hotel where we found that there are not much food items to select from. And the food was just ok ok.
Our FIRST DAY in Armenia began with an amazing view of Mount Ararat from the Arch of Charents. It is one of the best places to see Mt. Ararat. This arch is located literally on the roadway. 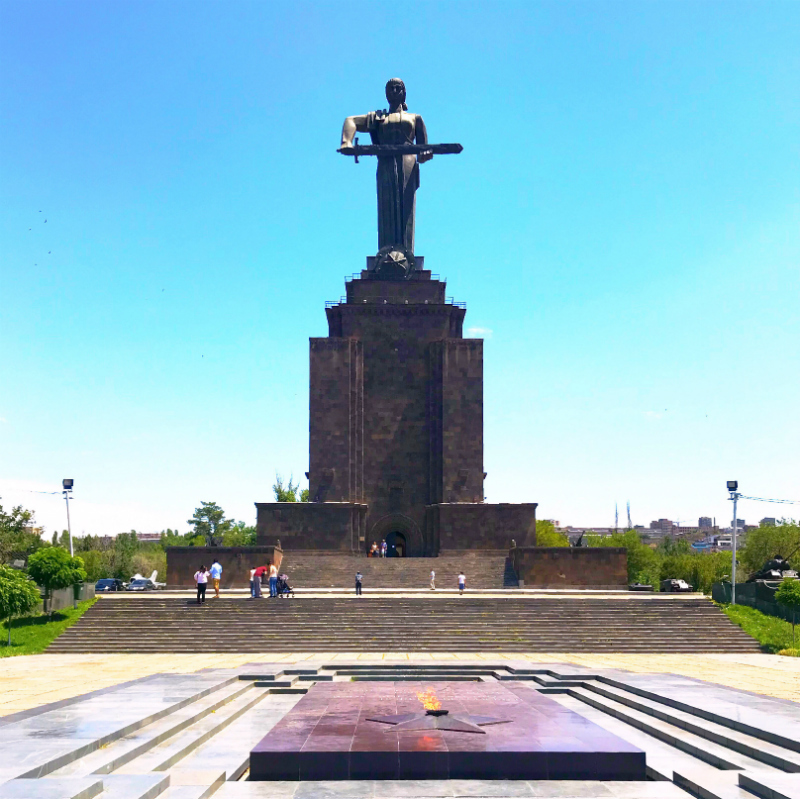 The monument was built in honor of one of Armenia's most famous poets, Yeghisheh Charents. He often used to visit these places and admire the amazing scenery. The Arch of Charents is one of the most popular places to admire the incredible view and take photos. 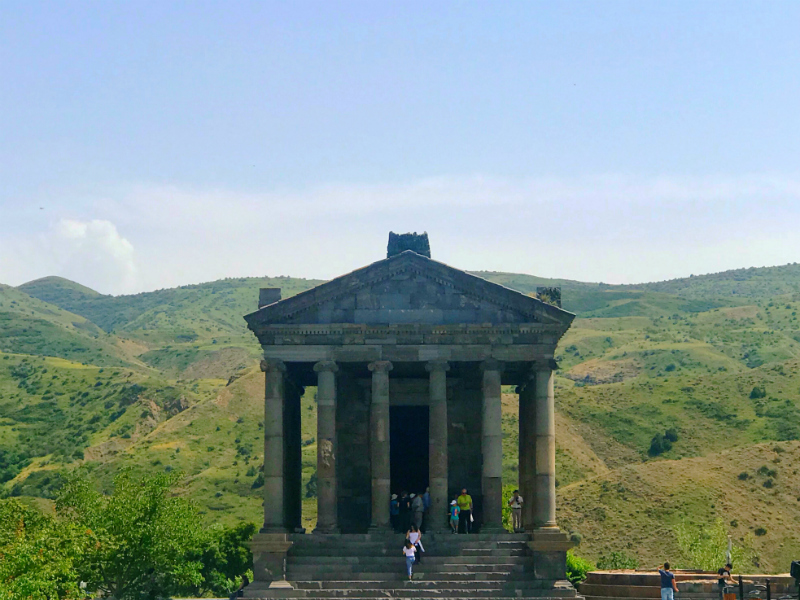 Our next destination was Garni Temple which is located in the village of Garni in Kotayk Province, Armenia. 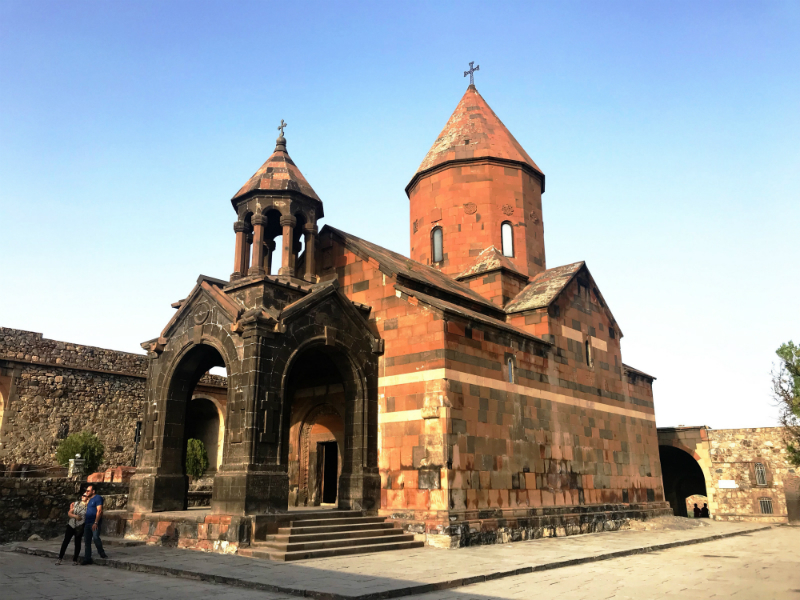 It is one of the oldest sights in Armenia that survived the destruction of pagan temples following Armenia's conversion to Christianity in the 4th century. It remains a mystery why the temple survived. The ticket price to the Garni Temple - AMD 1500. Our next stop was the Monastery of Geghard (means a spear in Armenian). Its location makes it an interesting attraction of Armenia. A beautiful landscape of Geghard is framed with towering cliffs. Geghard Monastery is the unique creation of Armenian architecture, carved out of the adjacent mountain. 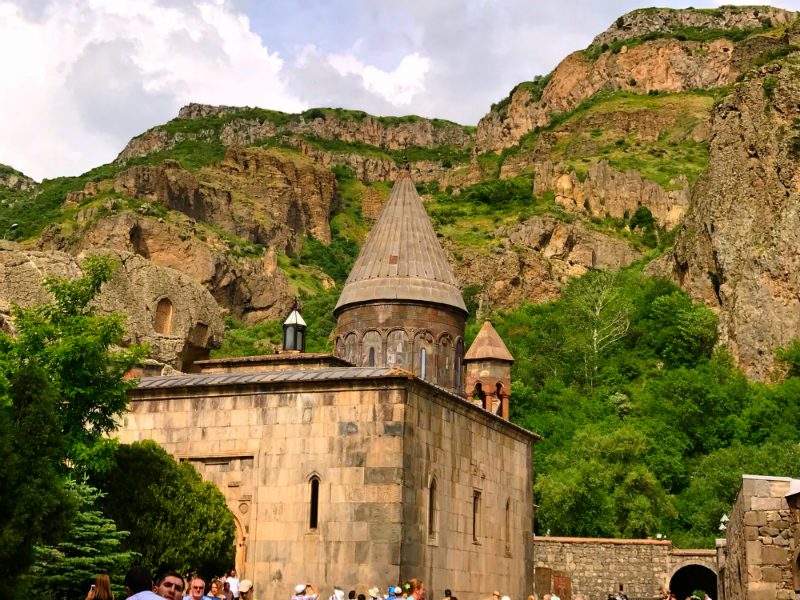 It's one of the most scenic monasteries in Armenia. We also bought some sweet bread (Gata) from the stalls outside the Monastery. Everyone seems to be selling the same bread but it is not true. We bought from 2 different stalls and the taste was completely different from each other. You can also taste before buying one. Our last attraction for the day was Khor Virap Monastery. Khor Virap offers a magnificent view of Mount Ararat, one of the most famous Armenian sights. Khor Virap is tied with the life of St. Gregory the Illuminator. Gregory was the first person to bring Christianity to Armenia due to which he was prisoned there for 13 years. Hire a tour guide and he will tell you the whole story behind the Monastery of Khor Virap. We captured the beautiful scenic views of the biblical Mt. Ararat. The holy Mount Ararat is located in Turkey now. This is how our 1st day was properly utilized by visiting so many attractions in one day. It seems like a hectic day, though it was not at all. We had fun. The Hovhannavank monastery is located in the village of Ohanavan in the Aragatsotn Province of Armenia. It has rich stone decoration and many engravings. The church is cross-shaped and there are two-story sacristies in each of the four corners of the church. The dome has an umbrella-shaped roof, which is unique to the Armenian churches. The Armenian Alphabet Monument is dedicated to the founder of Armenia's alphabet, Mesrop Mashtots. An Armenian architect created the carved Armenian letters near Mashtots' final resting place in 2005. We didn't really understand the letters, therefore, asked the guide to find the initial letter of our first names. We took photos with our initial letters and that's it. There was nothing more to do there. 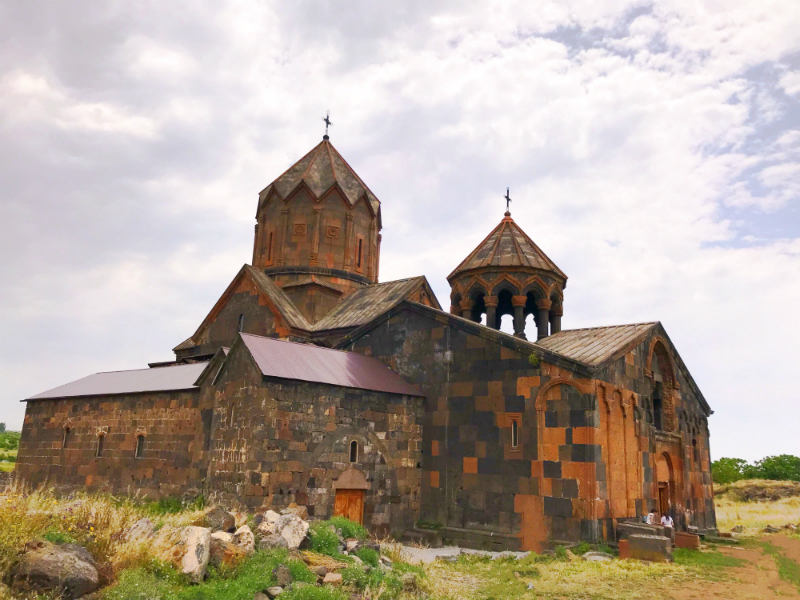 Now our final destination for the day was the 7th-century Amberd Fortress and Vahramashen Church (also known as The Church of Amberd), located above sea level, on the Slopes of Mount Aragats. 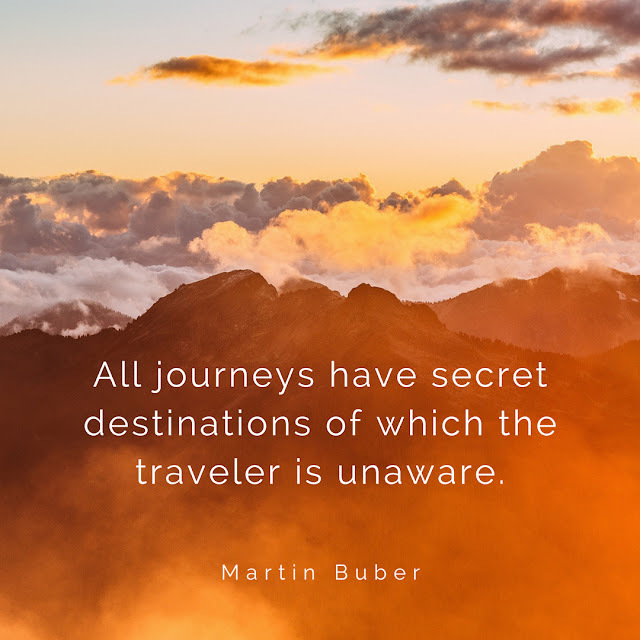 On the route to Amberd, there are legends about this mountain route where magnetic or supernatural forces are believed to work. The car without a driver climbs up the mountain itself. All against all laws of physics! It was really amazing for us to experience this mystery. Besides, when our tour guide kept a water bottle on the road, it started to miraculously climb the mountain itself. It was unbelievable and interesting at the same time. After visiting Amberd, we returned to the Republic Square in Yerevan where we had some food at Tavern Yerevan restaurant. It was around 7:30 pm but still daylight. So, we had more time to explore the city for the day. 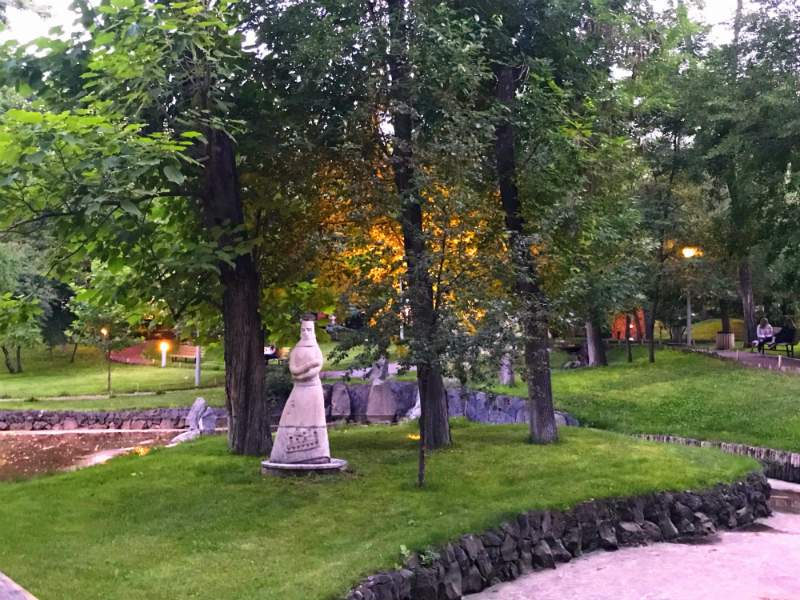 So, we went to visit the Lovers' Park that was near our hotel. 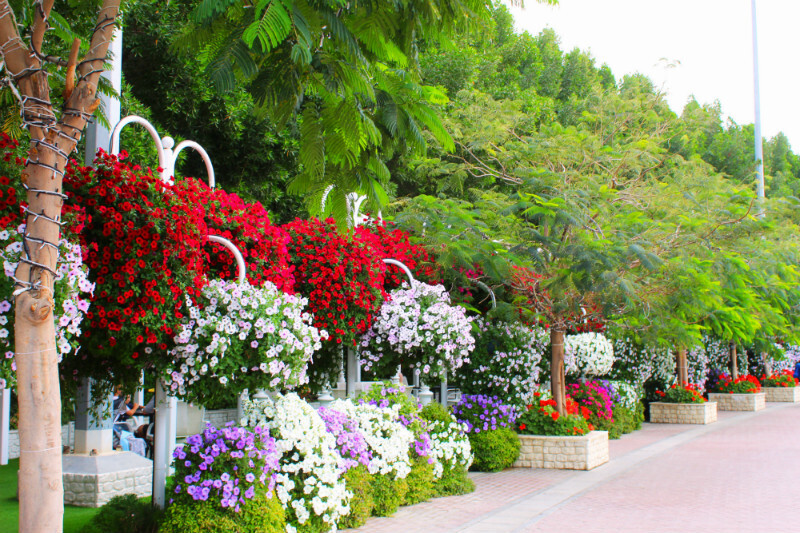 It's a small and very cozy park, located on Baghramyan Avenue. 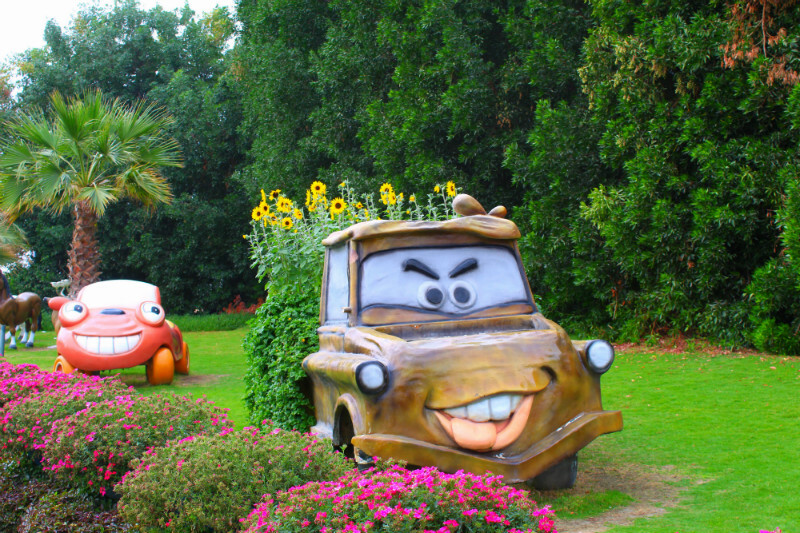 The park is the most beloved place of young couples. 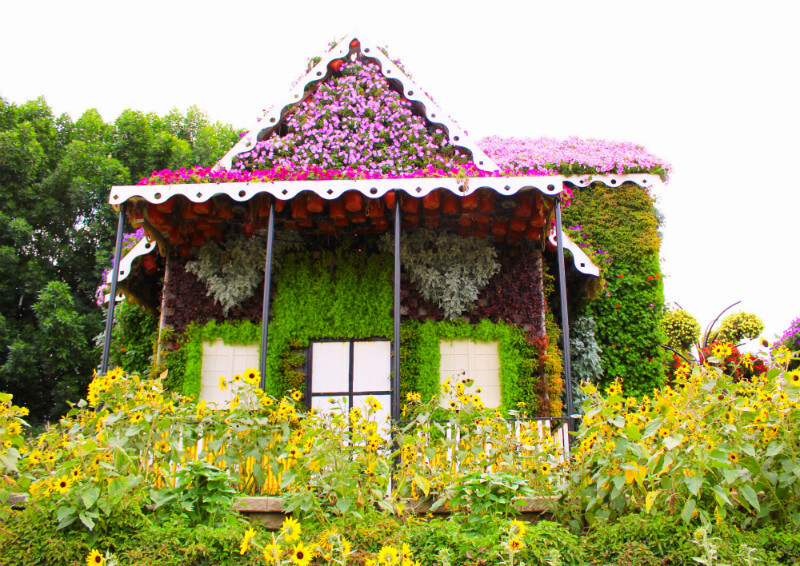 It is a park with some sculptures, mini-waterfalls, and a small artificial lake with a romantic atmosphere. After taking some quality photos in the park, we headed back to our hotel. Next day, we had breakfast in the hotel and then checked out of the hotel. 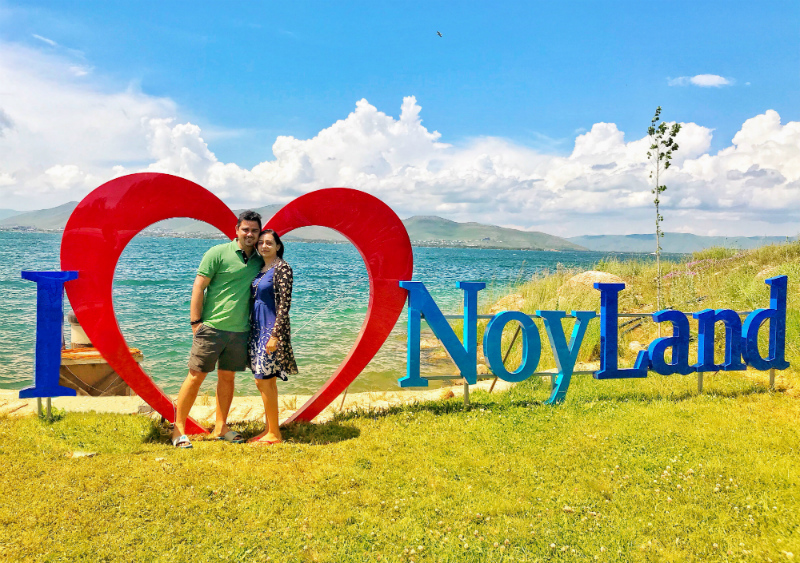 For our THIRD DAY, we had already booked two cottages in the Noy Land resort, located on the bank of Lake Sevan. The same tour guide dropped us to Sevan from Yerevan. Now, we didn't want to make our day tiring, so decided to stay at our resort for the whole day. Another reason to stay in Noy Land was its location. It is one of the top-rated locations in Sevan. It was so calm and peaceful that we couldn't resist its beauty. We had lunch after setting down in our cottages and then explored the resort. We booked a boat ride for the evening. The weather was awesome and it started raining as well. We enjoyed a lot there. At around 7:30 pm, we went for the boat ride in the lake. It was a wonderful experience for all of us. The ride was around 30 min long where the lake offered the stunning sunset views. We took a lot of photos and videos around the lake. After enjoying our boat ride, we spent some time had dinner in the Noy Land Resort. 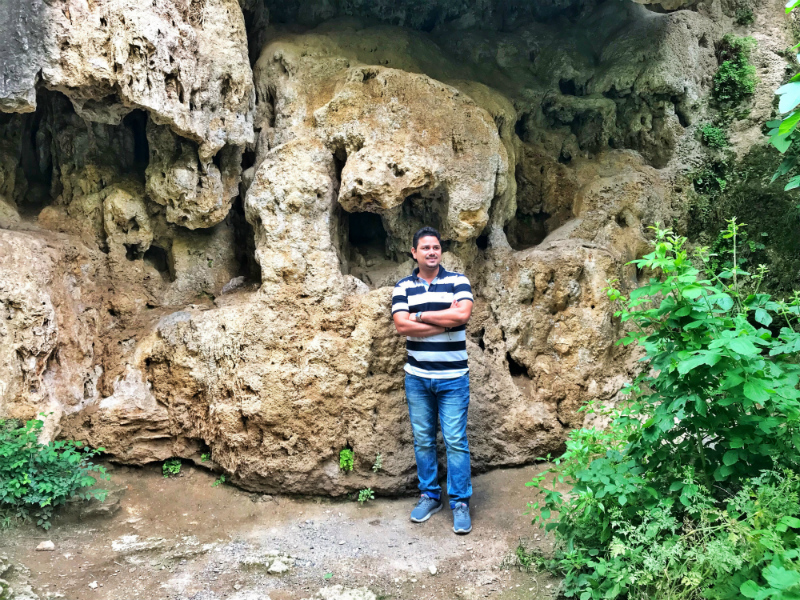 On our FOURTH DAY, we hired another tour guide who turned out to be the best guide we could have ever found in Armenia. His name is Grigor Badalyan and he has his own tour agency. He was our personal tour guide. We have not planned much for our fourth day but the guide was really helpful taking us to the places that were not even in our itinerary. Our first spot was Hayravank Monastery which is located on a rocky hill of Hayravank village. A fantastic view opens up to Sevan Lake (the largest lake in the Caucasus) and its surroundings from the hill. We enjoyed the view and had some cool snapshots. It was fun. Noravank is a 13th-century Armenian monastery standing out not only with its appearance but also the surrounding marvelous scenery. It is gorgeous and magnificent in terms of both, the location as well as the architecture. 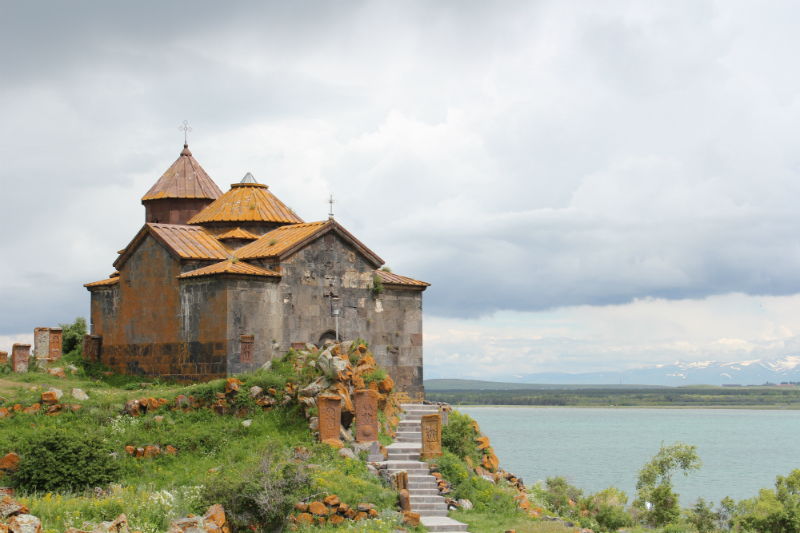 It's a holy, serene destination spot in Armenia that should be experienced by all. 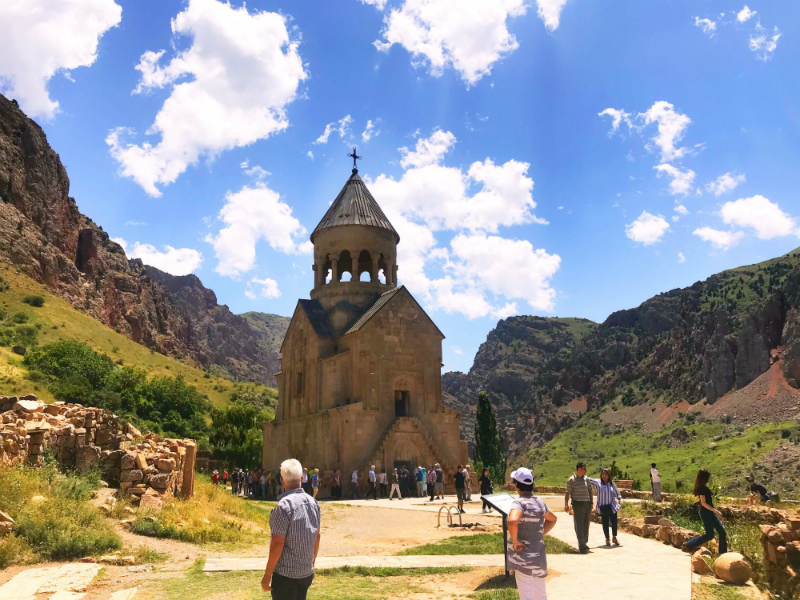 The monastery of Noravank is famous for its two-storied St. Astvatsatsin church. We all climbed the narrow stone stairs outside the Church to get a closer look at its dome and it was an amazing experience. 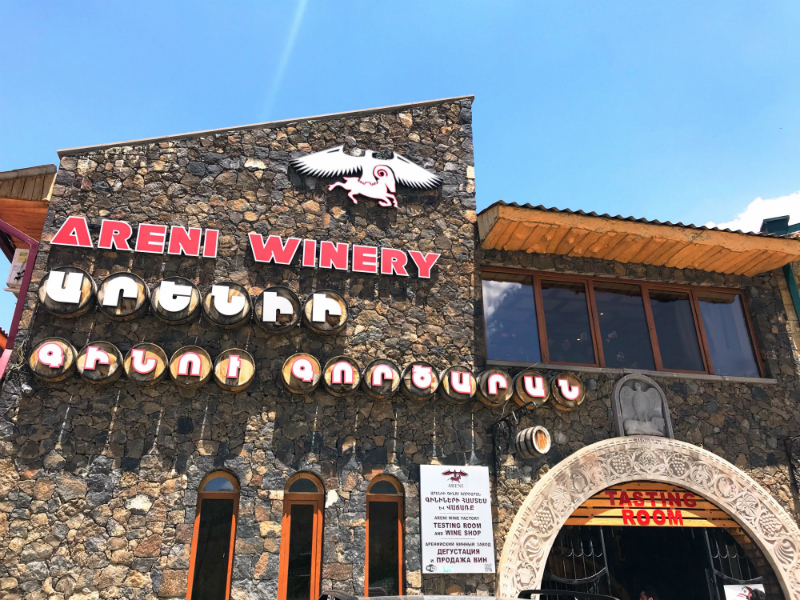 Our next spot was Areni Winery which is famous for wine tasting in Armenia. They offer all sorts of grape and fruit wines. This small factory aims to produce quality wine and preserve ancestral traditions and techniques. They offer their local wine to taste with their bread. And the combination is really amazing. After tasting a variety of wines, we took a small tour of their factory where they produce wines. We went to the cellar where they keep the wooden barrels, clay vessels, and the bottled wines. It was a great experience learning about their process of wine production. We also spent some time in their cafe upstairs where we had Armenian organic tea. The cafe's interior was quite creative with lots of messages and drawings on the wall related to friendship, love, family and more. We realized that most people were in a hurry due to the time limit provided by their tour guide. If you really want to explore the city without being in a hurry, Grigor Badalyan is the best guide. Our next destination was the Food Court as we were all hungry at this time of the day. We had some delicious food like veg. Pizza (we asked them to customize for us because there was no veg. Pizza. lol), chicken shawarma wrap, Armenian yogurt drink (it is very similar to our lassi in India), etc. 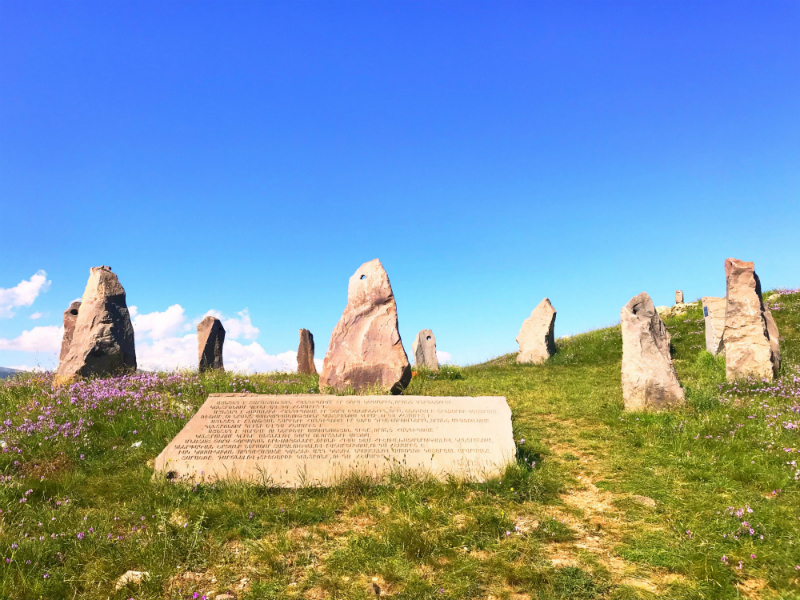 Near the city of Sisjan in Armenia, there is a mysterious group of megalithic stones with unexplained destiny and even age. Army of Stones. It is believed to be an astronomical observatory. We didn't know much about this place but it was a nice place for taking pictures and enjoying the view. We just spent a few minutes there as there was nothing more to do. Devil's Bridge is one of Armenia’s natural wonders, located below Tatev Monastery. The part of the canyon, where the bridge is located, is so narrow, that even sun rays can't reach this part. Since its formation seemed unbelievable, it got the name "Devil's bridge". People used to say, that this was the Devil’s work for sure. 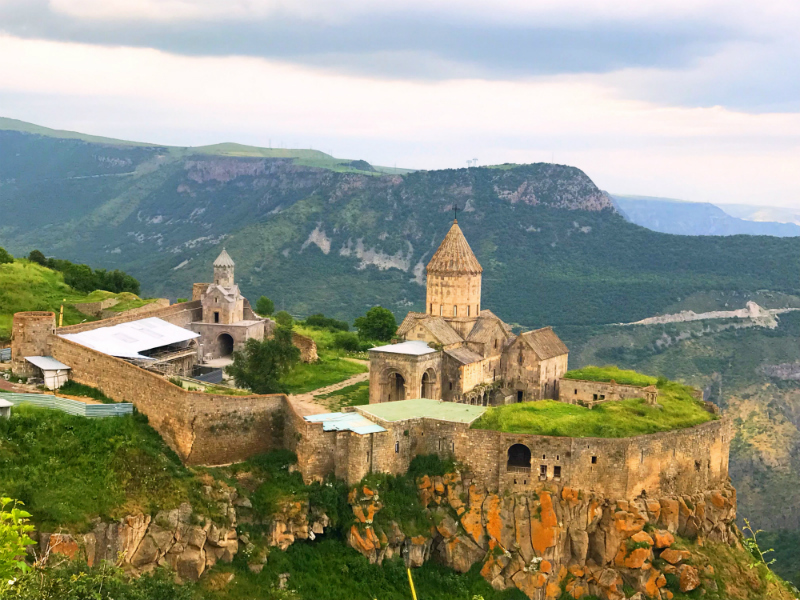 Tatev Monastery is a 9th-century historical monument and one of the oldest and most famous monastery complexes in Armenia. It is easily accessible by the world’s longest reversible cable car. But make sure that you don't plan to go on a Monday because it is closed on Mondays. Unfortunately, we planned it on Monday and it was closed. But the tour guide had another long route to reach there that was rich with various wonderful sights, worth seeing. He took us to a viewpoint from where Tatev Monastery looked beautiful. 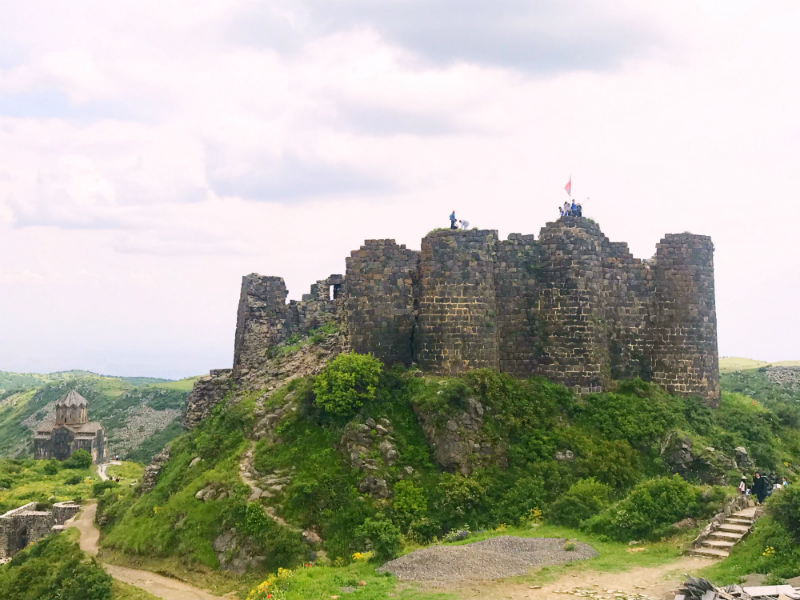 It was worth the long road trip to Tatev. There's an interesting history that we learned about this place. It is said that the architect who built this monastery, at the end of his work, came to the very edge of the cliff and asked to bring him two wood chips. Taking them he crossed himself, prayed to God and said: "Ogni surb ta tev", translated as: "May the Holy Spirit give me the wings" and jumped into the abyss. Suddenly, the wings grew on his back and he flew away. 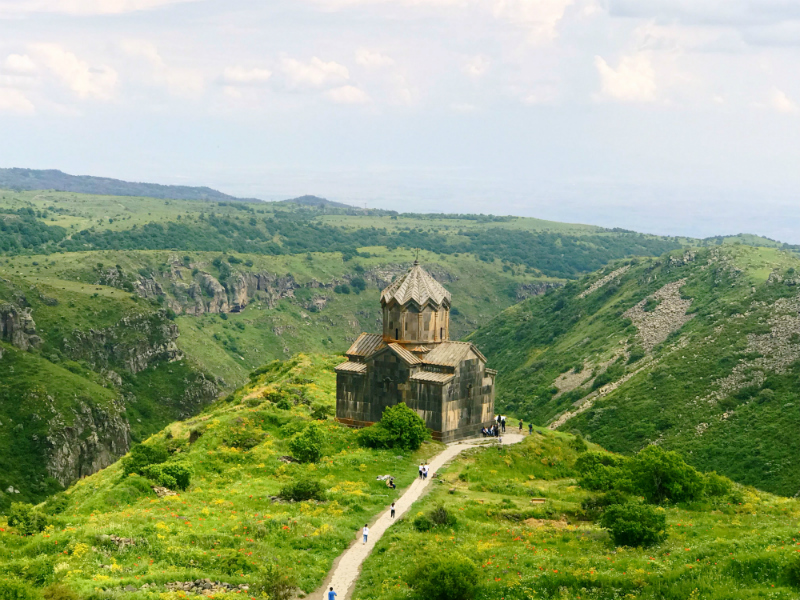 The monastery was named in honor of this miracle - Tatev, that means "give wings". There are many versions of this story. Not sure which one is the exact truth. On our 5th Day (also our LAST DAY), we traveled back to Yerevan with the same tour guide. We had a short stop at a place in Yerevan providing an amazing city view. After a few photo shoots, the guide took us to the Victory Park in Yerevan. The Victory Park is dedicated to the victory of USSR in the World War II. 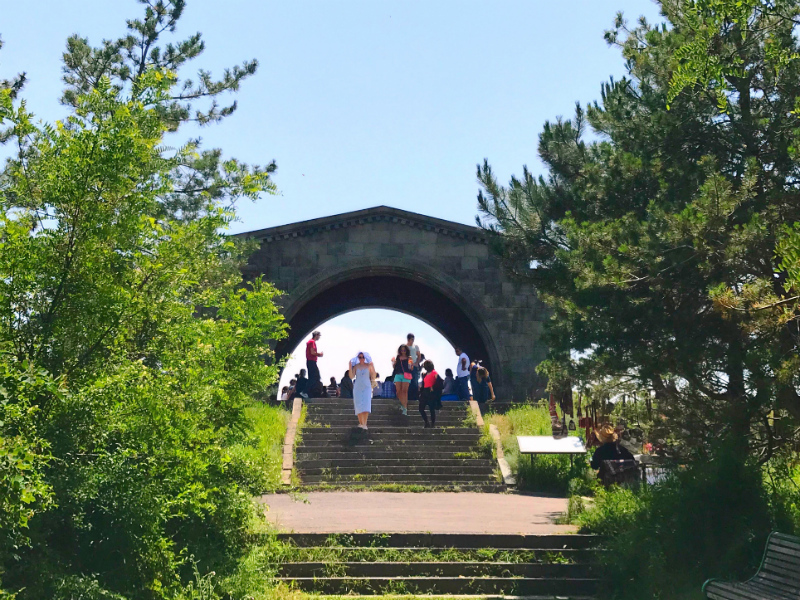 Besides wonderful nature, amazing atmosphere and cafe, this park offers a plenty of amusements attractions, museum and the statue of Mother Armenia. 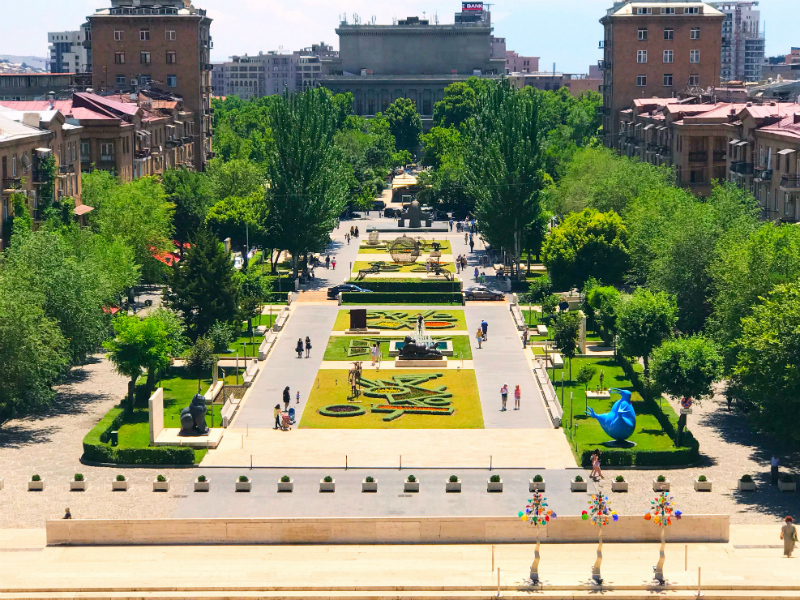 We enjoyed the park view, clicked some great pictures and then exit from the entrance of the park towards the Yerevan Cascade, as suggested by the guide. Located on top of the Cascade complex, there's a kind of monument which is worth checking out. It gives you a nice view of Yerevan. Since we are moving down from top to bottom of the Cascade complex, we really enjoyed the mesmerizing view of the Yerevan city. The Cascade is a giant stairway made of limestone in Yerevan, Armenia. Having five levels, the number of the stairs is 572, ascending along 302 meters upwards. The exterior of the Cascade features five levels adorned with fountains and modernist sculptures. At the base of the Cascade is a garden courtyard with statues by contemporary sculptures. There are a number of cafes and restaurants on both sides of the Cascade. 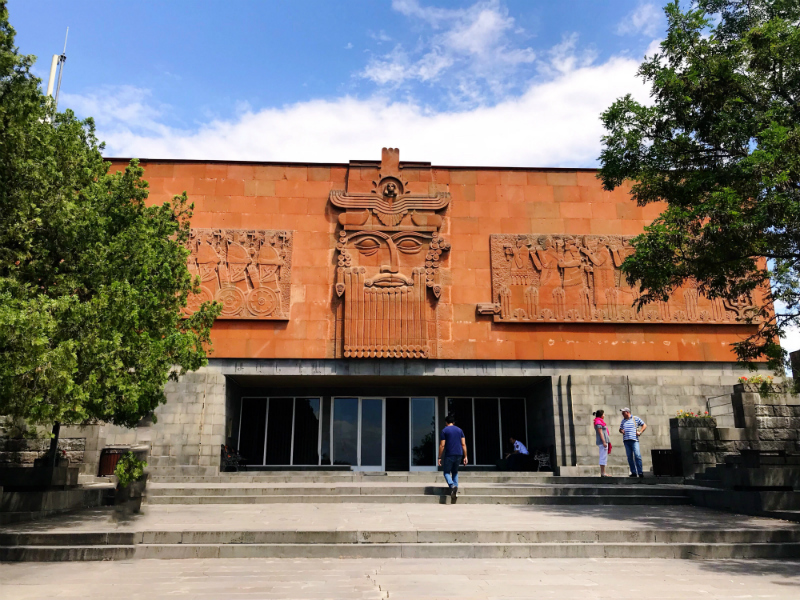 Cafesjian Museum of Art is also situated within the cascade complex of Yerevan. We missed it because we didn't have much time as it was our last day. 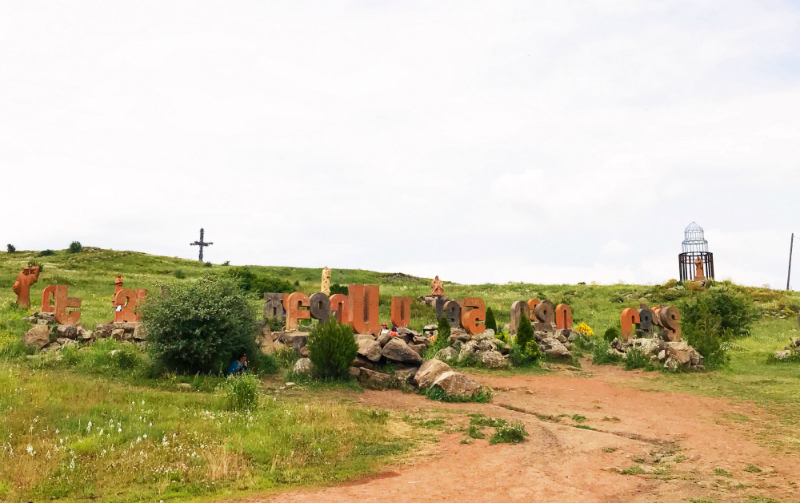 After enjoying the scenic view of the city, the guide picked us to the next destination, Erebuni Fortress & Museum. Erebuni Fortress, also known as Arin Berd (Armenian meaning: "Fortress of Blood") is an Urartian fortified settlement, located in Yerevan, Armenia. We first visited the Erebuni Fortress which is why we didn't really understand what this fortress is all about. After spending a few minutes roaming around the Fortress, we went to the Erebuni Museum. The Museum stands at the foot of the Arin Berd hill, on top of which the Urartian Fortress Erebouni has stood. We hired a guide who explained to us all about the collections in the museum including the findings from Arin Berd. The guide also narrated the story behind the Erebuni Fortress as well. The ticket price to the museum - AMD 1000 for adults & AMD 300 for schoolchildren, students, and seniors. The ticket price to the guide - AMD 2500. Our trip to Armenia was a wonderful experience for all of us. Armenia is truly unique in its culture and history. Have you been to Armenia? How was your trip? 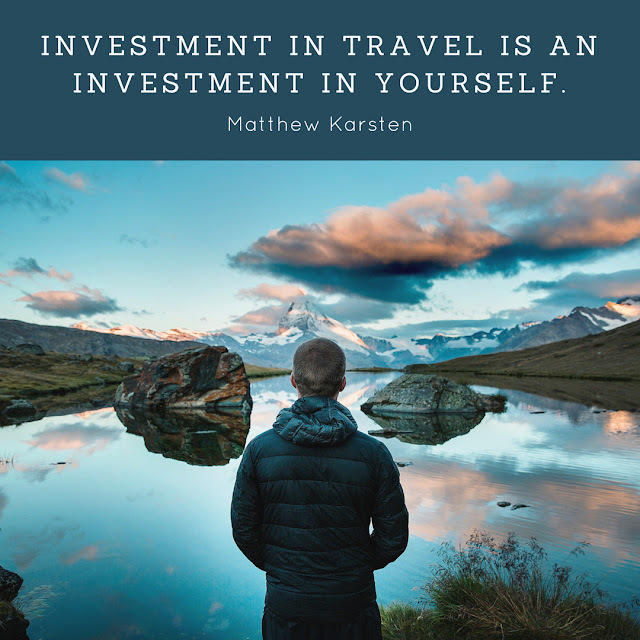 Feel free to share your travel experience in the comments below. 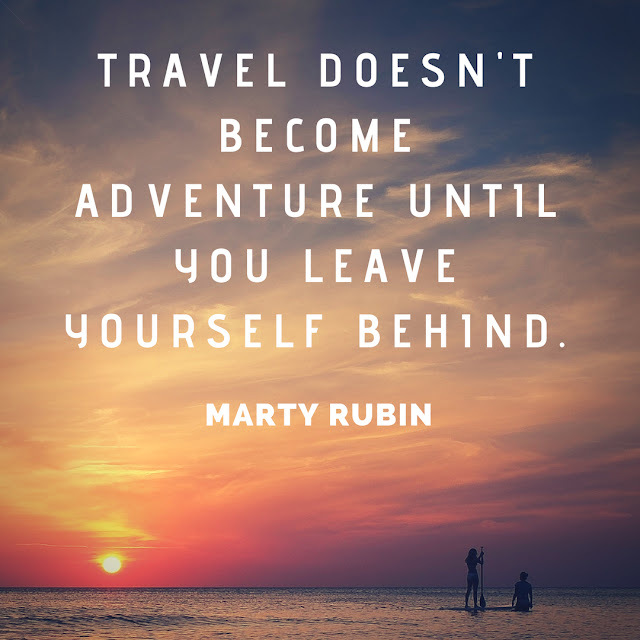 There's nothing better than exploring the world...whether solo or with your loved ones. 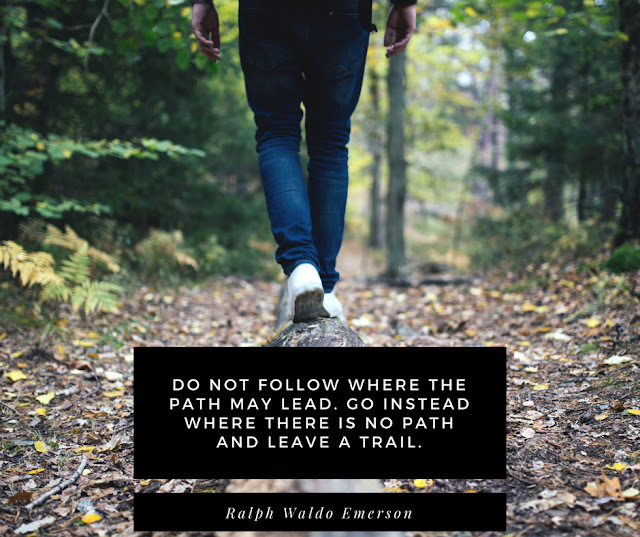 Every once in a while we all need some motivation to travel and explore the world. 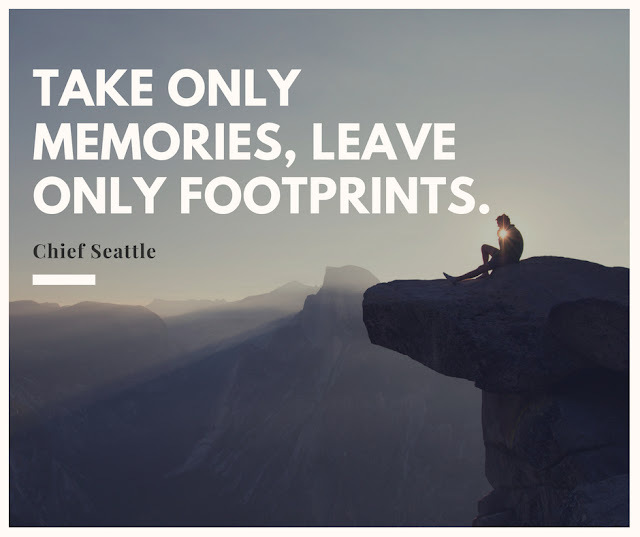 "If we were meant to stay in one place, we'd have roots instead of feet." 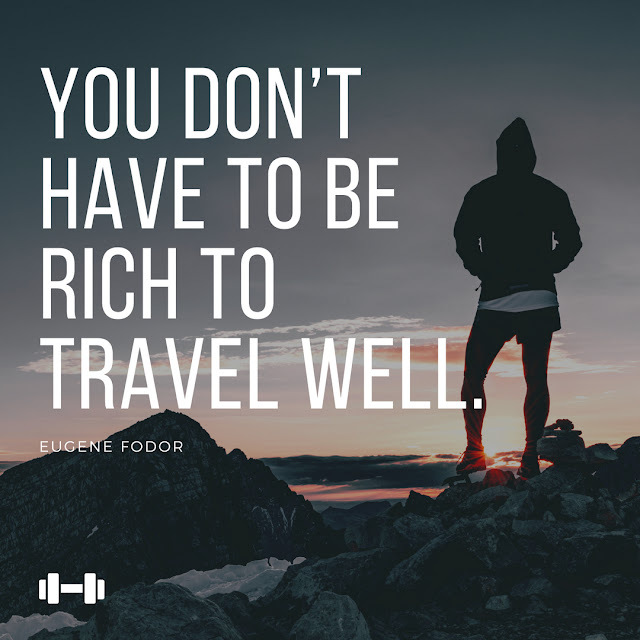 You don't have to be rich to travel well. 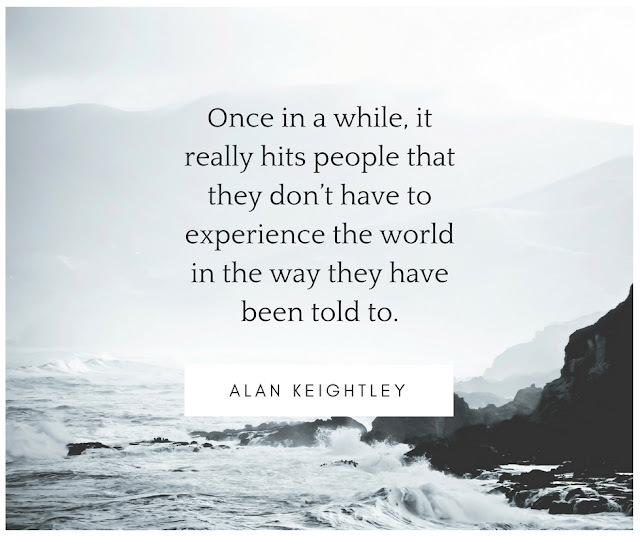 Once in a while, it really hits people that they don’t have to experience the world in the way they have been told to. Bangkok is the capital of Thailand, mostly known for its chaotic, crowded streets, cheap prices, nightlife, and never-ending traffic. Bangkok is not known for jaw-dropping tourist attractions but it is a city that you will definitely fell in love with. You just need to mix yourself with it and then you will start feeling home. A tuk-tuk is essentially a rickshaw with a small engine fitted in. 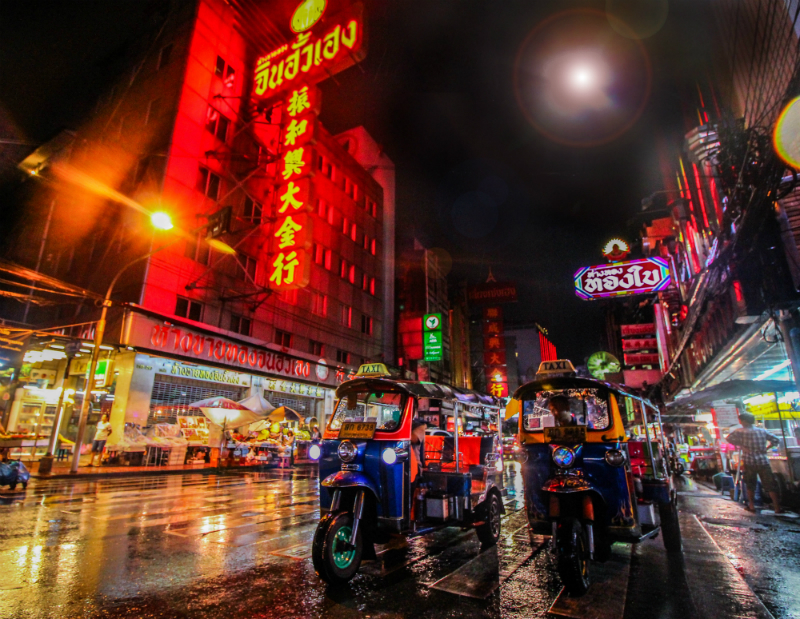 Tuk-tuks have become one of Bangkok's most popular transport among tourists and visitors. Tuk-tuks are most ideal for short trips. If you are thinking that taking a tuk-tuk is cheaper than a taxi, you are wrong. It's usually not. 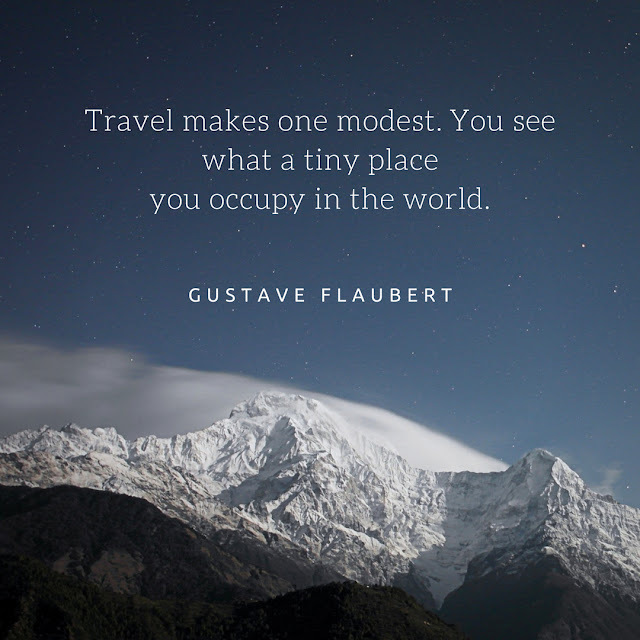 But riding a tuk-tuk will be a unique experience for you. So, do not miss it. Try once at least. 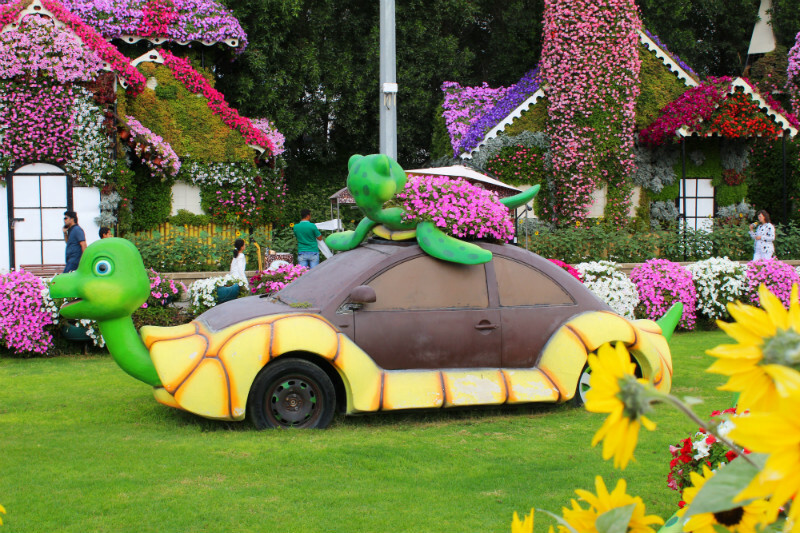 Safari World is one of the top tourist attractions in Bangkok that consists of two parks: Marine Park and Safari Park. 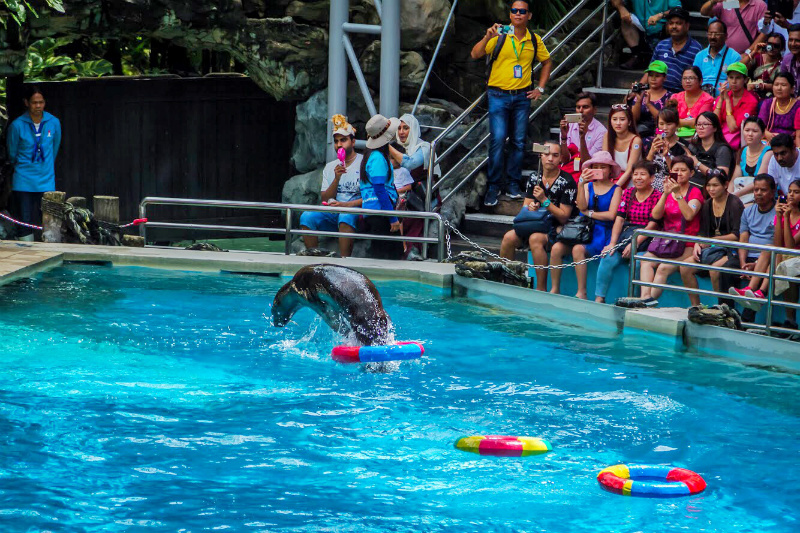 Marine Park is more of a traditional zoo where there are a variety of marine animals with many shows of trained dolphins, birds, seals & apes, lots of food stalls and plenty of souvenir shops. Do not forget to enjoy the Orang Utan Boxing show which is the world famous and funniest show. There are many other great shows like Sea Lion show, Dolphin show, Cowboy Stunt show, Spy War, and Bird show. 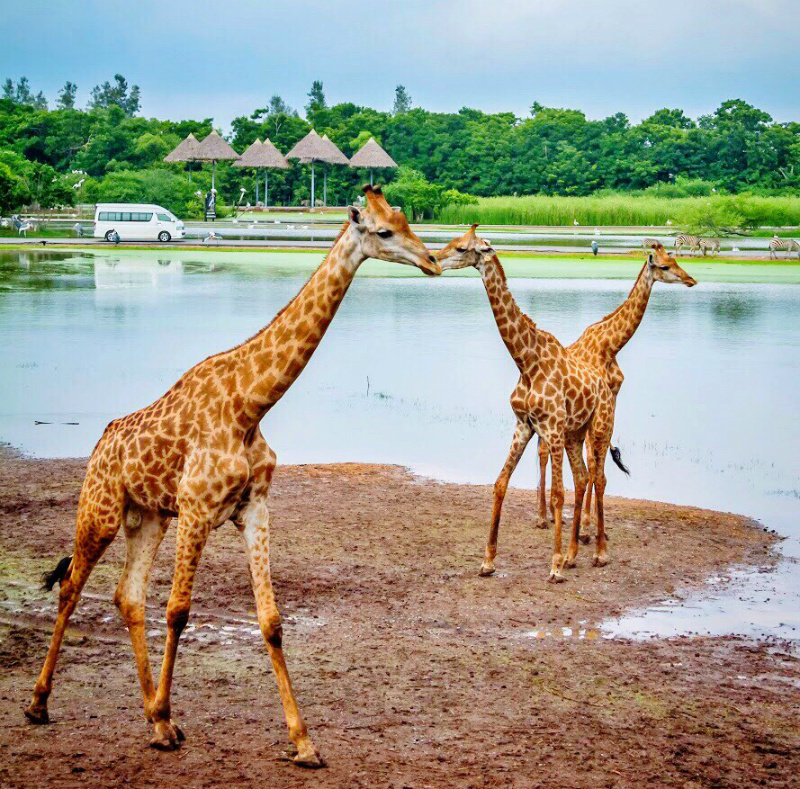 Safari Park is an open zoo where the ultimate safari experience features hundreds of wild animals like zebras, deer, giraffes, tigers, lions, bears, elephants and others from all over the world. You can also feed the Giraffes there which is a great experience. However, you have to pay extra to buy food for Giraffes. There are many floating markets in Bangkok but Damnoen Saduak floating market is the most popular one. 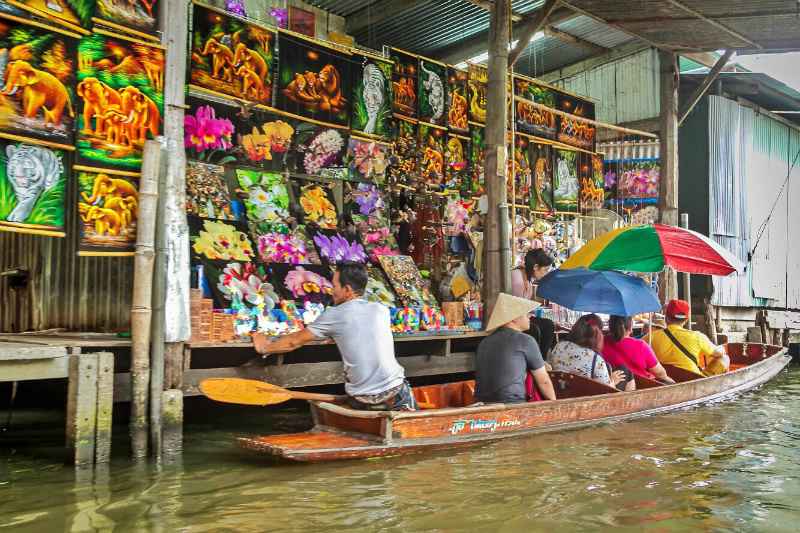 A trip to Bangkok is not complete without a visit to the floating market. 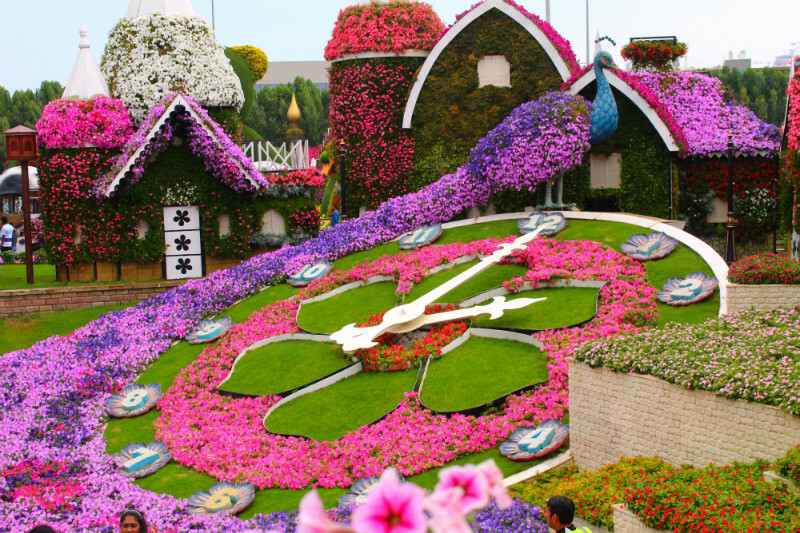 Do not miss it while traveling to Bangkok. Located around 30-40 minutes from Bangkok in Ratchaburi province, Damnoen Saduak is a very beautiful market with lots of colorful vegetables, fruits, and refreshing drinks. It's an attractive tourist destination to see this old style and traditional way of selling & buying goods. Wat Phra Kaew is also known as the Temple of The Emerald Buddha, regarded as the most sacred Buddhist temple in Thailand. 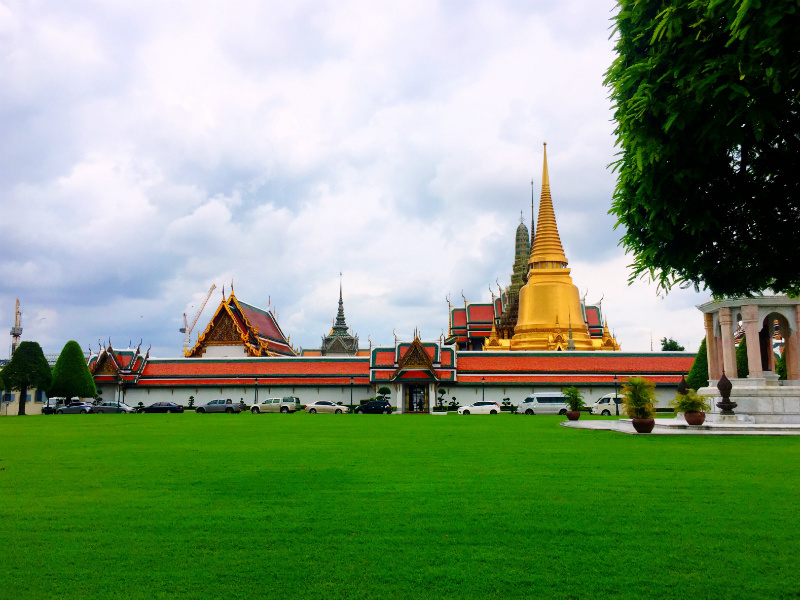 It is beautifully housed with the statue of the Emerald Buddha. Wat Phra Kaew is located within the grounds of the Grand Palace which is a famous landmark of this beautiful city, Bangkok. The Grand Palace and Wat Phra Kaew are open daily but close by mid-afternoon, so get there early. Wat Pho is also known as the Temple of the Reclining Buddha, located next to the Grand Palace and behind the Temple of the Emerald Buddha. Wat Pho is the largest and oldest Buddhist temple in Bangkok. Apart from the Reclining Buddha, the whole Wat Pho compound is full of artwork and Buddha statues. 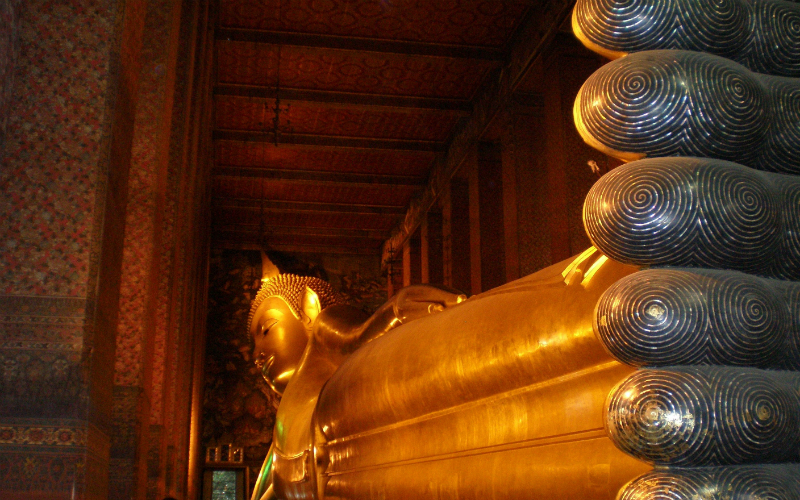 The Temple of the Reclining Buddha is also a training center for traditional Thai massage. Wat Arun Ratchawararam, also known as the Temple of Dawn is named after the Indian God Aruna (God of Dawn). 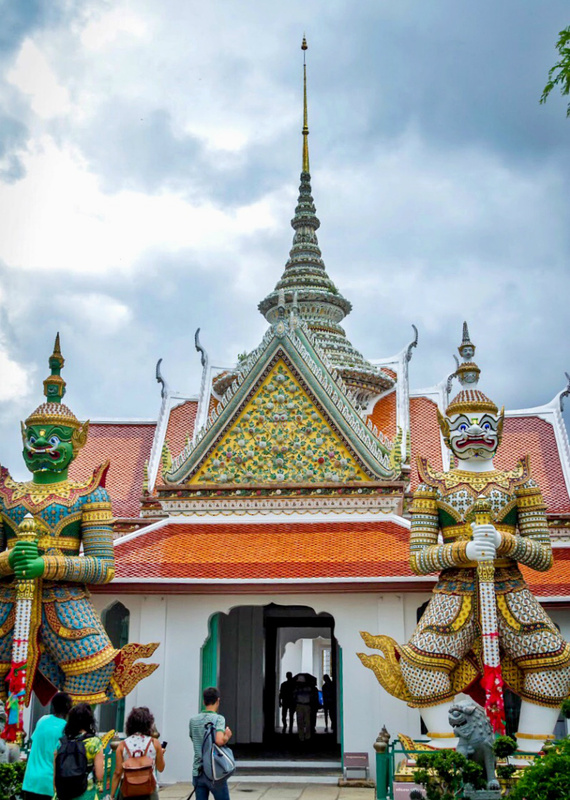 This temple is located on the west bank of the majestic Chao Phraya River. It has an imposing spire over 70 meters high, beautifully decorated with tiny pieces of colored glass and Chinese porcelain placed delicately into intricate patterns. The main feature of Wat Arun is its central prang and it is possible to walk a limited way up the very steep stairs of the main prang, which gives an amazing view of the Chao Phraya river. There are many unique attractions in Wat Arun that will amaze you with its beauty. If you are a first-time visitor to Bangkok, don't pack too much for the trip because you're definitely going to buy a lot there. Bangkok is a shopaholic's paradise where you can buy quality stuff at cheap prices. A few other things that you should not miss in Bangkok are to try some street food, drink their coconut water, ride an elephant and get a Thai massage. Pattaya has now become one of the most popular beach destinations in Southeast Asia. Pattaya has magnificent beaches and is one of the most enjoyable places to stop for a few days. Pattaya is often considered to be a destination for bachelors. However, it is not true. 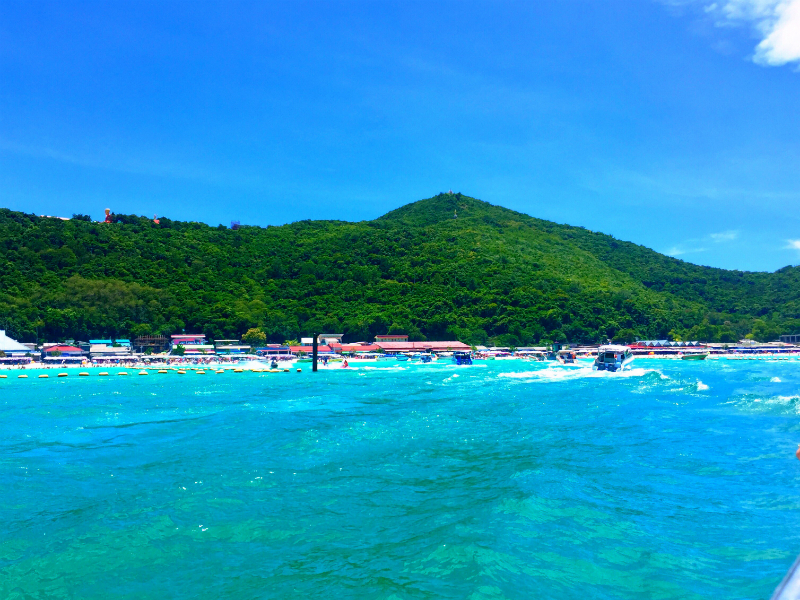 Pattaya is more than just its nightlife. 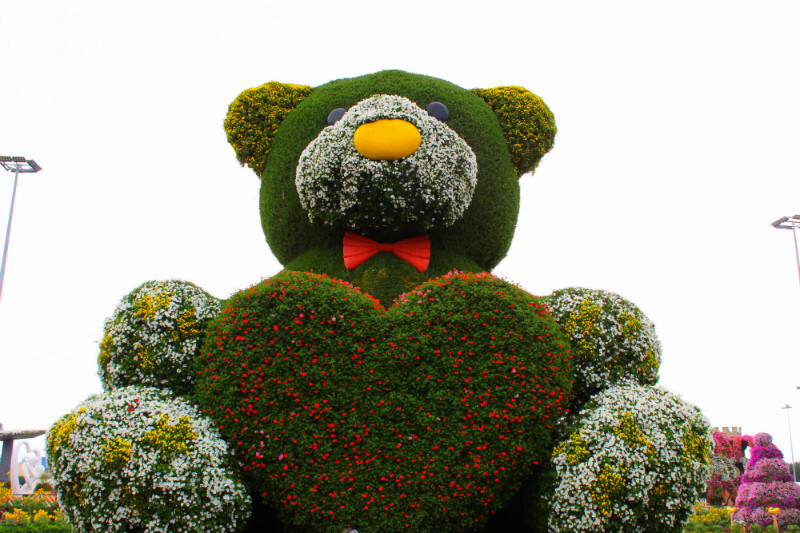 It has a lot to offer for families and couples as well. 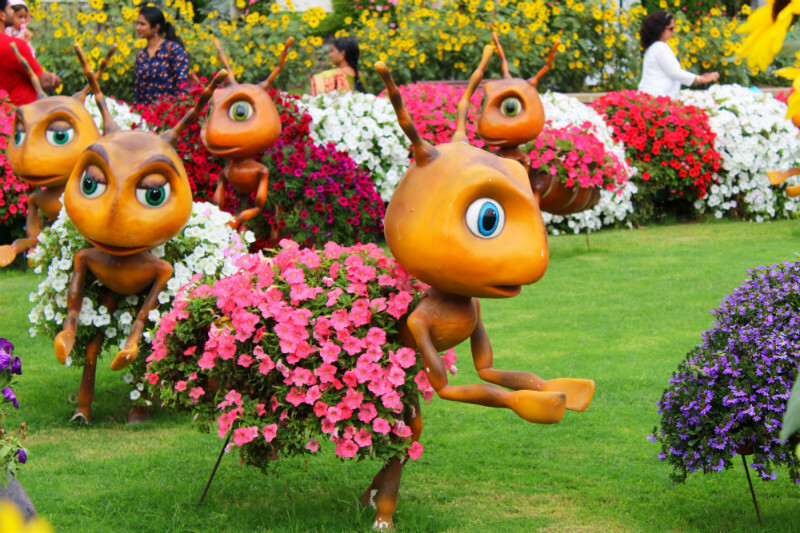 It has attractions that can delight people with varied interests. Explore the beautiful Coral island with a lot of water sports activities like snorkeling, parasailing, underwater walking, and banana boating. Or just sit back and relax on the beautiful beach. Walking Street is one of the famous Pattaya nightlife. 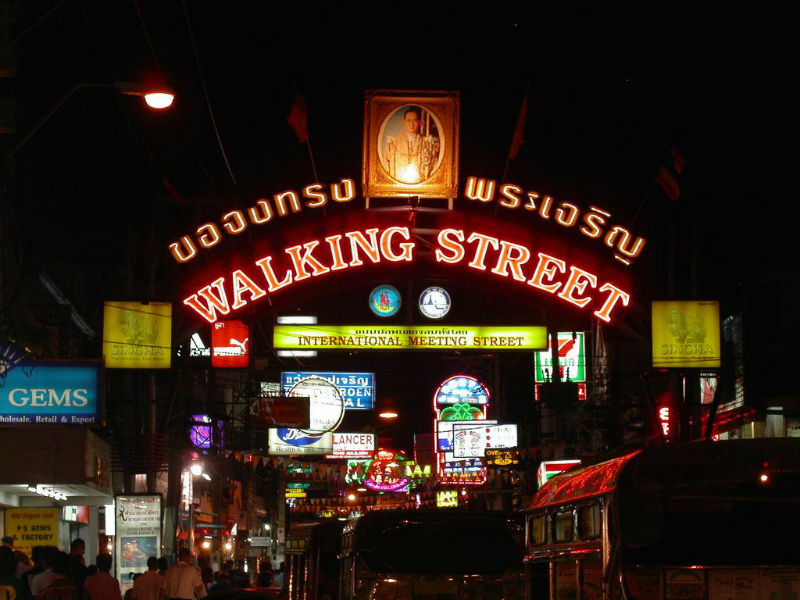 Being the most exciting street in the world, there is so much to see and do on the Walking Street. The street with neon lights and music from the different genre, food vendors, live music venues, beer bars, go-go bars and street events make it the biggest spot in Thailand. The street is free from vehicles daily from 6 pm to 4 am. And the legal closing time is 4 am. Watch Cabaret shows (for adults only). 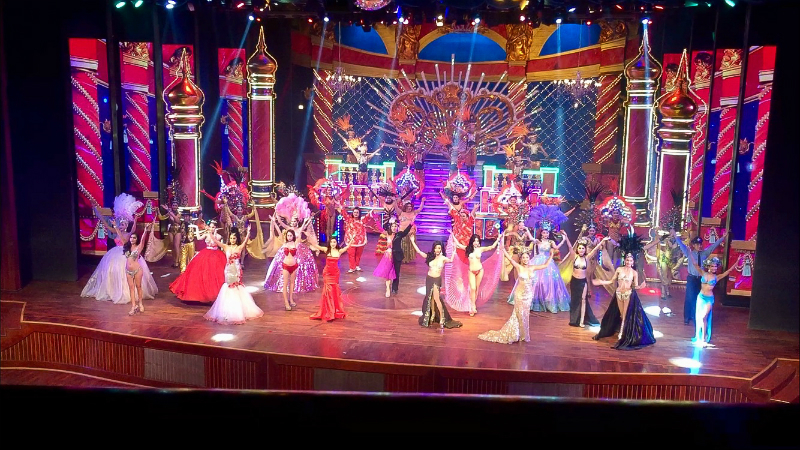 The cabaret show Alcazar is extremely popular and one of the major tourist attractions in Pattaya. It is the major ladyboy show in Thailand. The show presents a combination of dance, music, and drama with popular Thai and English songs. The daily show timings are 5:00 pm, 6:30 pm, 8:00 pm, and 9:30 pm. 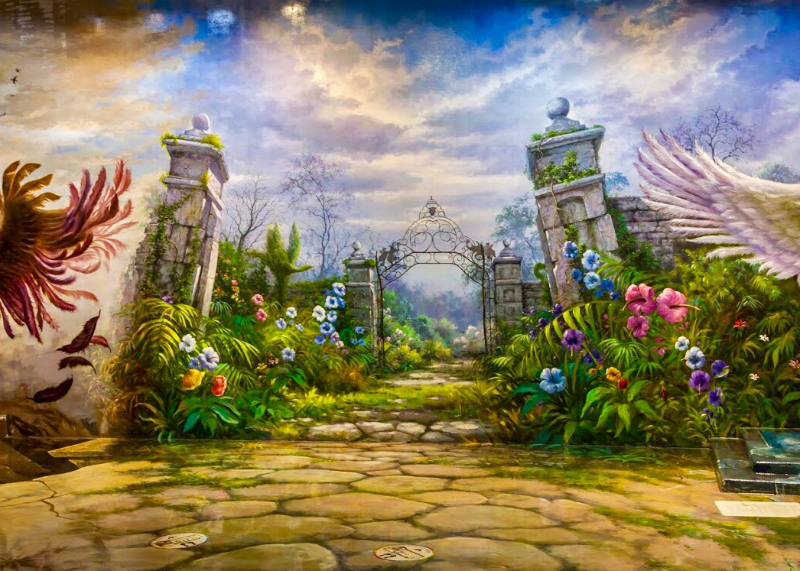 It is the first and only one illusion art museum with 3D illusion paintings. Try to visit on weekdays to avoid the crowd on weekends. The gallery is set up perfectly so you can take pictures in a way that it looks like you are part of the painting. If you want to make your photos great, find a cool angle to make 3D paintings alive. Art in Paradise opens daily from 9 am to 10 pm. 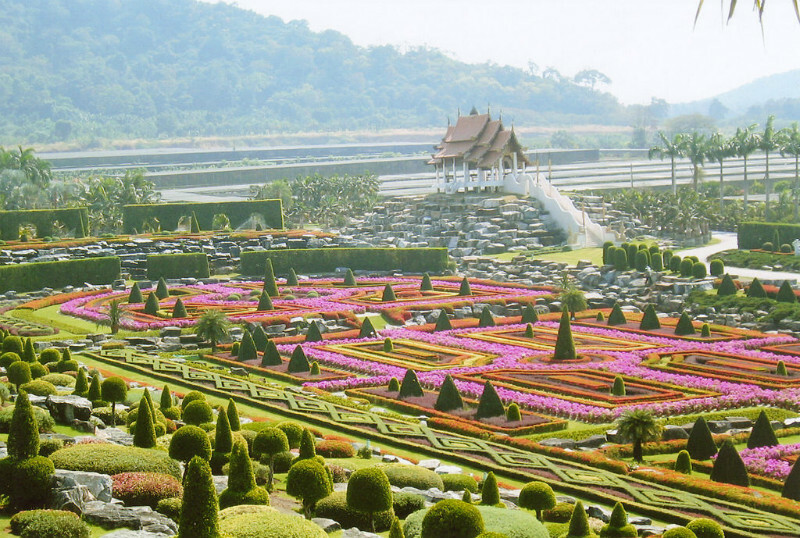 The beautiful Nong Nooch Garden is a sprawling 500-acre botanical garden and one of the major tourist attraction on Sukhumvit Road in Chonburi Province, Thailand. 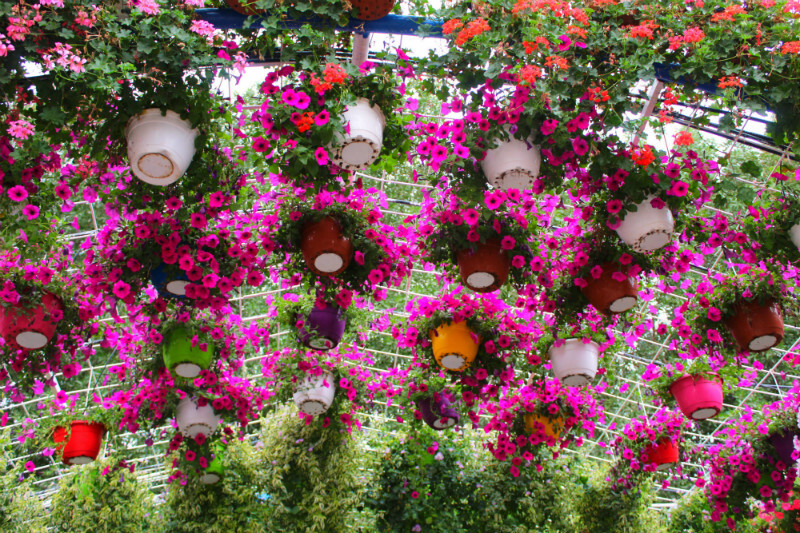 It is the largest botanical garden in South East Asia. 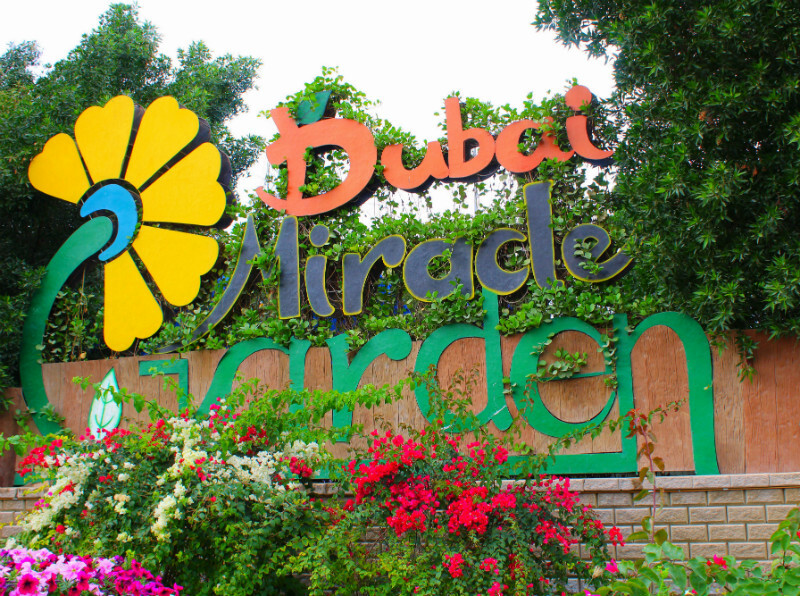 The garden features a lake, orchid nurseries, waterfalls and a vast, magnificent landscape. You can also enjoy a number of shows like folk dances, sword fighting, elephant shows and Thai boxing. 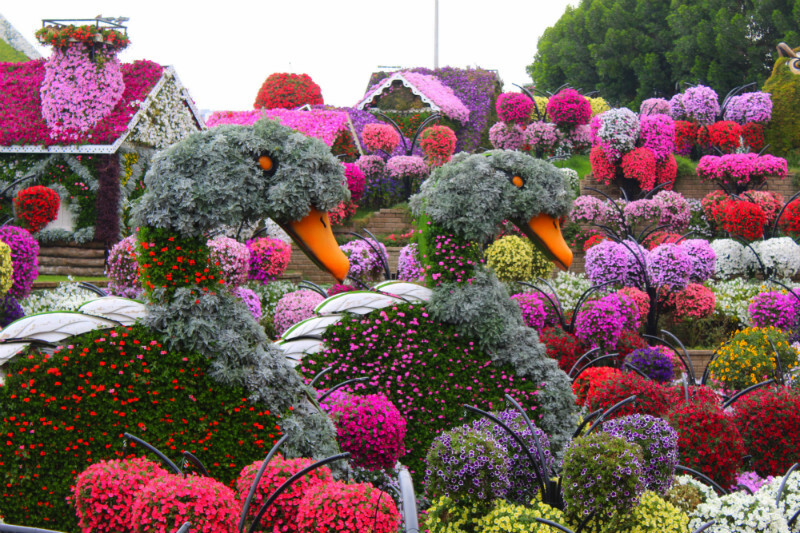 Nong Nooch garden opens daily from 8 am to 6 pm.